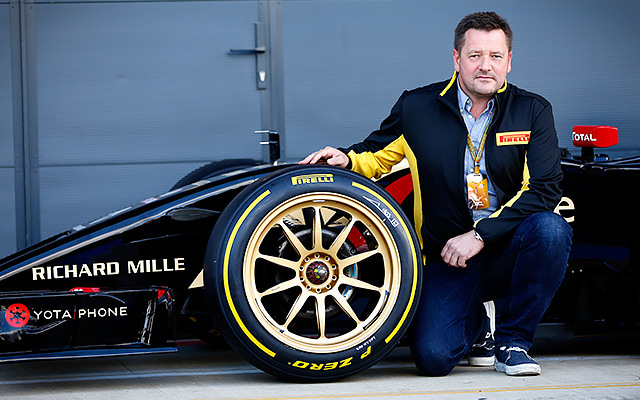 During Silverstone testing this week, Pirelli teamed up with Lotus to test out their prototype 18 inch tyres. They gained plenty of attention for doing so, although they introduced the concept rubber off their own back, rather than being requested to do so by Formula One's governing body. As motorsport director Paul Hembery said at the time, the tyres would make F1 more road relevant and that's a direction the sport is always trying to head towards. Charles Pic was the lucky driver that got to pilot the Lotus on the new tyres. He took the rubber out for 14 laps on a current car with small tweaks made to allow the tyres to fit properly. There's a noticeable difference when you compare the new tyres to current F1 wheels but by themselves, they don't look out of place on the car. However, Pic is sure they'll make quite a difference if they're ever introduced. The overall grip was very low, I think it was five or six seconds off the pace, mainly for the reason that the rest of the car was made for the normal tyre, not the prototype. It is true that they are more reactive and nervous, and then on top of that you lose a lot of aero... If you look at handling, of course it is not good - but that was not the point of the test. The point of the test, as Hembery explained, was to see how the tyres looked and if it was at all viable as a future direction. In the politest possible way, he said: "We’ve heard a lot of opinions already and we look forward to canvassing other opinions in the coming weeks and months." If they do slow the cars down, that might work in their favour, as the FIA are constantly looking at ways to cap off the high speeds that aerodynamicists are clawing back each season. Making the developments more relevant to every day road use is a plus, and the change in the overall look is one of the more palatable we've seen in recent years. With Pirelli so noticeably quiet this year, it's no surprise that they pulled something out of the bag to gain headlines and attention. Despite the cynical start to proceedings, it could be a positive change for the sport.